Let the festivities begin! 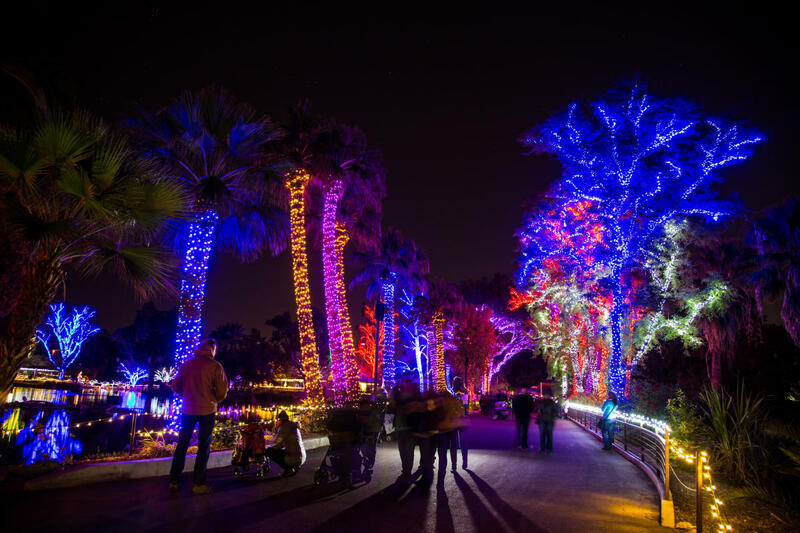 In Chandler, Arizona, it&apos;s the most wonderful time of year and is especially inviting to visitors with its mild winter weather and plenty of decorations, activities and festive events that feature holiday music, dazzling lights, amazing food, and tumbleweeds. Yes, tumbleweeds! 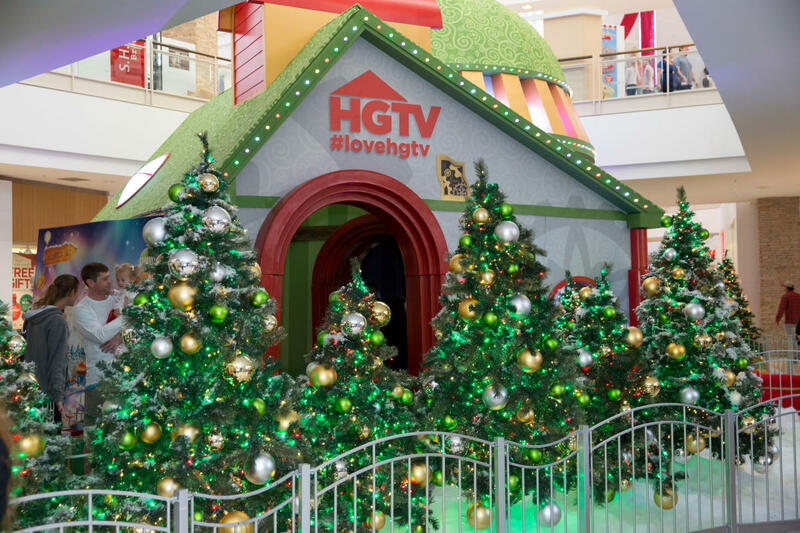 In addition to great shopping and the wonderfully decorated hotels, spending the holidays in Chandler is sure to get you into the holiday spirit when you attending one of the many uniquely, Arizona holiday traditions that are perfect for a family outing, a date night or a fun outing with friends. Event festivities start at 4:30 p.m., Parade at 6:45 p.m. and Tree Lighting at approximately 8:00 p.m. and the festivities continue till about 9 p.m. 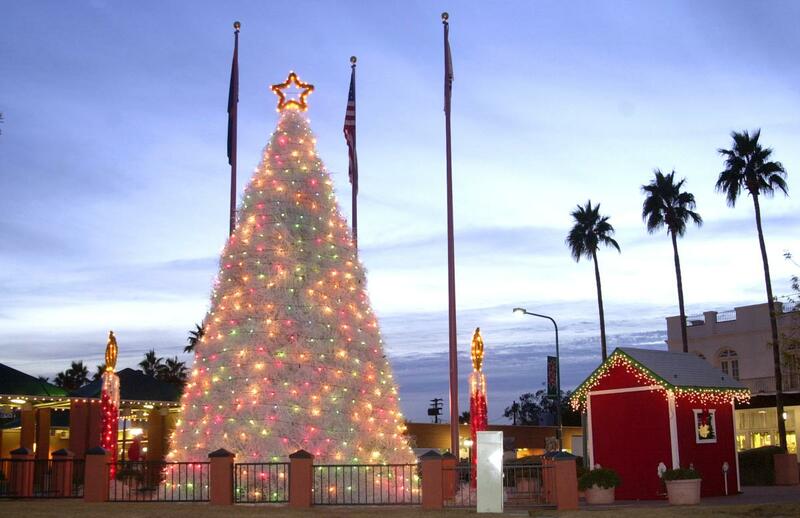 The most iconic holiday tree in Arizona has been a tradition in Chandler for 60 years, the Tumbleweed Tree, a uniquely southwestern tradition that will delight all ages. It all began in 1957 and each tree is created from over 1,000 local tumbleweeds, gallons of paint, 65 pounds of glitter and thousands of lights – the tree lighting is not too be missed and takes place at about 8 p.m. on Saturday, December 1, 2018. Make plans to arrive early and catch assorted festivities starting at 4:30 p.m. followed by the parade at 6:45 p.m. Typically, the Tumbleweed Tree is on display through early January - so be sure to stop by for a photo op! Feeling nostalgic? 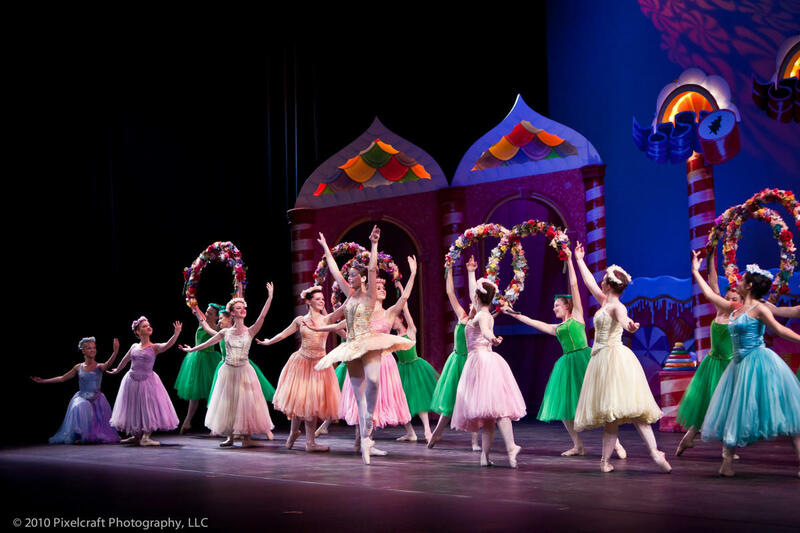 Make plans to take in a holiday favorite at the 32nd Anniversary of The Nutcracker at the Chandler Center for the Arts! Clara’s sweet and magical journey will surround you as she encounters life-size mice, swirling snowflakes, dancing confections and the Sugar Plum Fairy. A feast for the eyes and ears with colorful and imaginative costumes paired with Tchaikovsky’s original score, Ballet Etudes’ 32nd annual production of The Nutcracker is the perfect way to celebrate the holiday season with the entire family. Backstage tours are available following most performances. 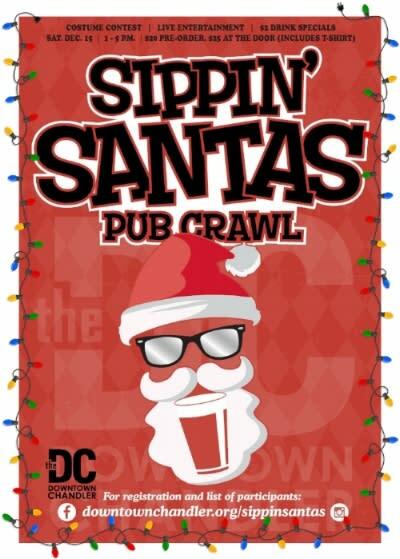 December 15, 2018 - self-guided pub crawls starting at 1:00 p.m. Enjoy live entertainment, endless Santa selfies, and a costume contest for cool prizes when the Sippin’ Santas Pub Crawl takes over Downtown Chandler on Saturday, December 15 at 1 p.m. Featuring more than a dozen Downtown Chandler hot spots, tickets are $20 when booked in advance and $25 day of the event. Admission includes an event t-shirt and a lanyard that gives you a $2 special* at each participating venue. The self-guided pub crawl is for those 21+ and purchase your ticket by Friday, December 7th to guarantee your shirt size. Show up decked out in your best Santa costume and cruise around on a self-guided pub crawl with your friends- because you can never have enough Santas. Registration will be held at the Crowne Plaza Phoenix Chandler Golf Resort Hotel from 1-3 p.m. This event is for those aged 21 and up. An age-old Italian tradition featuring a one-ring circus for the whole family featuring acrobatic feats, equestrian showmanship, canine capers, clowning and plenty of audience participation. While the circus comes to town each holiday season, each year the performance is new and original providing previous attendees with a whole new show. The Zoppé Family Circus is a once-a-year show you won&apos;t want to miss! Planning a visit to see Santa? He will be busy visiting multiple locations throughout Chandler – so save these dates and plan your visit. November 9th through December 24th, parents and guardians may make an online reservation and schedule their visit, but reservations are not required. November 9th - December 9th Monday - Thursday: 11 a.m. - 8 p.m. and Friday - Saturday: 10 a.m. - 9 p.m. Sunday: 11 a.m. - 6 p.m.
December 10th - December 23rd Monday - Thursday: 10 a.m. - 9 p.m. and Friday - Sunday: 9 a.m. - 9 p.m.
December 24th (Christmas Eve): 8 - 6 p.m. The Shoppes at Casa Paloma will feature Santa visits where visitors are able to commemorate their visit with an optional photo package. December 8th and 15th, and 23rd from 10:00 a.m. - 2:00 p.m.
Chandler Children&apos;s Choir Performance will take place on Saturday, December 1st - 1:30 - 2:30 p.m.
Dickens Carolers will be on hand Sunday, December 2nd, 9th & 16th - from 11 a.m. to 2 p.m.
Thursday, December 6th from 5-7 p.m.
Saturday, December 8th & 15th from Noon to 5 p.m.
Each year the Phoenix Zoo celebrates the holidays with ZooLights, a bright Arizona holiday tradition perfect for a family outing or a romantic stroll. Fun for all ages, ZooLights is a dazzling display featuring millions of lights and more than 700 dazzling light displays and several music and light shows synchronized to 15 thousand lights. ZooLights is open nightly to the public November 21, 2018 - January 13, 2019 from 5:30 - 10:30 p.m. and tickets may be purchased at the gate. 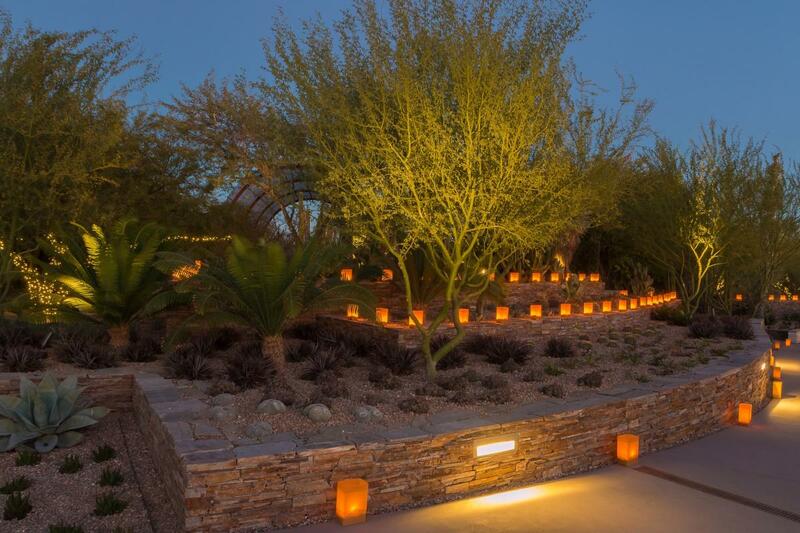 Each year, the Desert Botanical Garden features a southwestern holiday tradition, Las Noches de las Luminarias. Visitors make their way through the 140-acre garden guided by 8,000 hand-lit luminarias while enjoying live music played by local musicians staged throughout the garden trails for an event you won’t want to miss. The 2018 Las Noches de las Luminarias Schedule:December 1st - 23rd and December 26th - 31st. The garden will close at 4:00 p.m. on December 24th and closed all day, December 25th. General Admission: Adults: $34.95-$39.95.